Yesterday CRASSH event was by Vikki Bell discussing Art memory and politics from Buenos Aires and Belfast. She mainly focused on Art and the disappeared ones in Argentina . This was one of the stunning pictures she showed. by Nicolas Guagnini "In this work, which I have named 30,000 (the number of disappeared in Argentina), I used the picture of my father, a journalist who covered national and international politics. 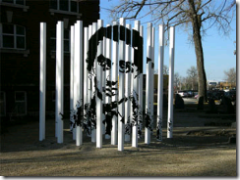 he was disappeared on December 12, 1977. As the spectator moves around the image, my father’s face appears and disappears." (Picture and words from North Dakota Museum of art). 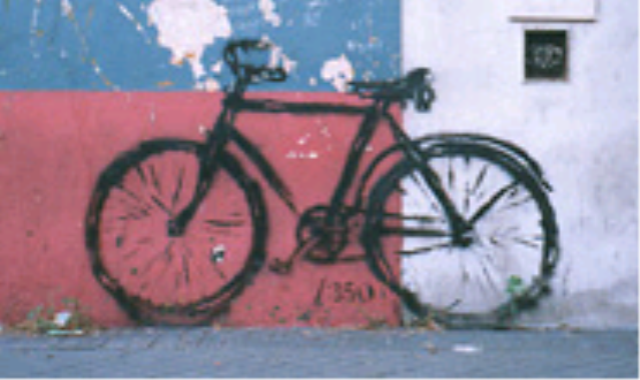 She also had images from Fernando Traverso "350 bicycles" as apparently the first sign of the disappeared was that their bicycles were abandoned in the streets.He "paints 350 bicycles all over his home city of Rosario, Argentina, one for each person disappeared. He photographs the graffiti bicycles and mounts them in the exhibitions as scenic "postcards." Very moving indeed. (picture from his site). She also went into some detail on the role of ESMA (Escuela de Mechanica de la Armada) although what happened within its walls had nothing to do with engineering in the navy (400 out of 5000 survived). Wonderful expression "Taking photo's is about decisions" (it was a pun about taking as in clicking and taking as in stealing) also spoke about Carlos Filomina and his umbrella hand and the fact that the junta didn?t get his paintings. Mortality and the famous over the centuries.